You might be wondering, "What makes this kind of archery different than other types?!" and that's a great question because there are a handful of differences that make mounted archery different than other archery sports. These differences make it both safer for the horse and enables the fastest shooting possible while maintaining the sport's historical roots in warfare. Only traditional curved and recurved composite bows can be used for competitions. Bows cannot be compound nor have a mechanical trigger or arrow shelf. You will shoot off of your hand just like it was done hundreds of years ago. The bow should have a draw weight between 25-35 pounds for thumb draw and 30-40 pounds for a three-finger draw though a higher poundage can be used but is not needed as the targets are only 7 meters away (almost 23ft) and the farthest shot on any competition course does not exceed 40 meters (131 ft), 25 to 40 pounds is plenty of poundage for your bow. Though most folks can learn right from the beginning with the horse bows and can pull them back without trouble, we sometimes start new folks and kids out with a regular Jr. bow for ease of use on the horse and safety then switch over to the bow needed once they have mastered the smaller bow that has an arrow shelf. Arrows can be made of wood, aluminum or carbon fiber. Two, three, or four fletchings on each arrow made of feathers are best. Though plastic fletchings are not desired for accurate shooting in competitions, they can be used by beginners just starting out as they are inexpensive and are stocked at most sporting good stores. Points/Tips are blunt or tapered in type (modified or combo field point) of 100-175 gr in weight. For accurate shooting, arrows should match your bow’s spine weight. We use bows without an arrow shelf, the arrows are not in line with the string and is affected by archers paradox. That means that the arrow has to curve around the handle instead of shooting straight. We tend to use carbon fiber arrows with a 400-600 spine. A 600 spine is softer and more flexible and thus does not hold up as well as a stiffer, less flexible 400 spine when you miss your targets or hit the target stand or a rock or tree. There's a ton of archery science in each person's bow and arrow setup. Some competitions require that you shoot from a quiver, while others require that you shoot from your hand (holding your extra arrows in your bow hand). There are several quiver styles - leg, hip and back quivers. The thigh quiver with individual slots for each arrow are preferred over the other types as they are the fastest to draw from. ​If you wish to purchase an adult sized traditional mounted archery bow there are many options on the internet. If you are looking for the best best of the best bows, the Saluki Demascus bows are the way to go. These are the very upper limits of price and craftsmanship. It does take up to a year to get one made for you and they are pricey ($1000+). Alibow has been a favorite place among horse archers to get their new bows recently. They provide a ton of different options and draw weights. Check out their page HERE . something basic and inexpensive, you can look for horse bows on eBay and Etsy that are between 50-54 inches long without an arrow shelf between 25 and 35 pound draw weight. ​Check out the MA3 website for additional equipment info and links to those that craft fine archery equipment. MA3 members receive a discount from some merchants! There are several types of draw techniques though the thumb draw is the preferred draw for competition because it is the fastest for nocking your arrow and allows you more time to shoot and less time loading your arrow. - Thumb Ring – protection against sore thumbs for those using the thumb release. ​- Athletic Tape - wrapping your thumb with simple spongy athletic tape works well and still allows you to feel with your fingertips for blind nocking. Once you develop a callus, you will not be in need of thumb protection unless you stop shooting for an extended period of time. ​- Thumb Glove – provides good thumb protection, and is more like using your bare fingers. -Three Finger Glove - for those who prefer the 3 finger draw, it covers and protects the 3 finders used. The standard competition targets are 3 to 4-foot (80-120 cm) diameter and are square or round. The targets are placed at a distance of 7 to 45 meters for competitions. For practice though your imagination is the limit! 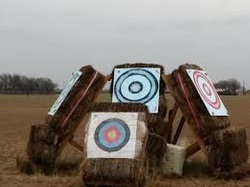 Store bought or home made targets are also great for practicing! For the beginner especially, arm guards are great to protect the forearm from bruising and cuts caused by the arrow fletching. Arm guards can be fancy and made out of leather or can be a cheaper alternative you can purchase at most sporting good stores.